Choosing your hardwood floor board direction can seem challenging if you have never done it before. 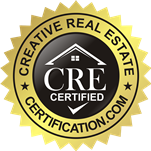 It may not occur to you at first, but the right direction can add a lot to the overall look of the floor. Here are a few things to consider before you lay your floorboards so you can achieve your perfect design. Which Way Should Hardwood Floors Run? Do you notice the direction hardwood flooring runs when you walk into a house? It can make a big difference in how it looks and how it behaves over time. Rule number one in laying hardwood flooring is that the wood boards should run perpendicular to the floor joists below. This allows the boards to “span” from one joist to the next and be much more solid. If the boards were run parallel l to the floor joists, most of the boards would sit only upon the plywood subflooring and not on any of the joists. The plywood is flexible and will “give” fractionally when walked upon. This is a recipe for squeaks and large gaps. 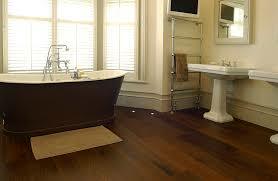 But another rule in laying wood flooring has to do with the aesthetics or look of the flooring. As a general rule, wood flooring looks best when running in the same direction as the longest dimension of the room. 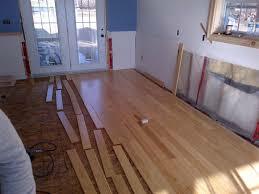 For instance, if the room is 10′ x 16′, the wood flooring will look best when running in the 16′ direction. The narrower the room, the more important this is. So in a hallway that is only four feet wide, the wood flooring really needs to run the length of the hall and not crosswise, if at all possible. 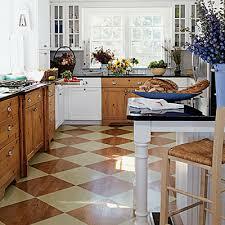 In rooms that are more square in shape, the direction of the wood flooring is not as critical. Also consider the view you have of the floor when you enter the room. The wood flooring looks best if laid perpendicular to your view direction. This will disguise the cracks between the planks. If you are looking straight down the planks, the seams between the boards will be more obvious. And if the seams are not perfectly straight, you will more readily see that variation, too. It’s not always practical to run the flooring in these optimal directions. But if you can do it, the benefits are real. If the floor joists below the wood flooring are running the wrong direction for the way you want the flooring to look in the room, ask your builder to install wood blocking beneath the floor from joist to joist to support a floor running parallel to the joists. This will cost a bit more, but it will be worth it in narrow spaces, like hallways. Of course, selecting the right wood for your floor is very important. Be sure to consider the grain and color of the wood and how it will look with other wood items in the room, like kitchen cabinets and wood trim. My floors run horizontal, which I prefer. We did have a choice, but then again, we built our own house so we got to decide pretty much everything.